Metalis hold one of the world's largest ranges of fully certified 4130 tubing and 4130 pipe. ASTM 519 Gr 4130 Steel Tubing. 4130 seamless pipe and 4130 tubing held in stock - One of the world's largest range of fully certified quenched and tempered low alloy 4130 pipe. We offer a wide range 4130 tubing of sizes and heavy wall thicknesses from 2” thro 8” nominal bore and heavy wall up to 50mm wall thickness. All variations of our 4130 tubing are manufactured to the tightest industry tolerances and are dual certified in strict accordance with the latest offshore drilling specifications. All 4130 pipe and 4130 tubing supplied by Metalis Energy is supplied in accordance with the following international standards where applicable. Material certification to BS EN 10204 3.1 is provided as standard, material certification to BS EN 10204 3.2 can be provided if required. Table 4.1 from the Metalis Energy Technical Data Book. Metalis can provide steel pipe and tubing in other material grades, please contact us with any other material requirements you may have. Speciﬁc working pressures available upon request. 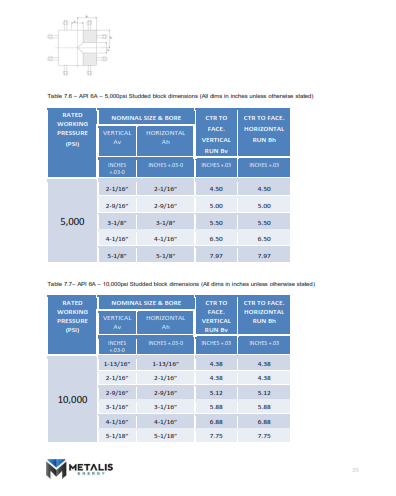 Download our Technical Data Book for the dimensional data of standard Metalis 4130 pipe sizes. Please note that these are lists of only the most common pipe sizes stocked by Metalis. If you have any requirements for speciﬁc pipe sizes or special materials (other than 4130)that are not in the lists please contact sales@metalisenergy.com and we will be more than happy to assist. Metalis hold one of the world's largest ranges of 4130 tubing in stock, available for immediate delivery. We have supplied seamless pipe extensively to many oil and gas clients and are one of the industries most trusted suppliers. We accept all small/large quantity orders. Contact us for a stock list or quick quotation. Product Names: AISI 4130 Seamless Pipe, 4130 Tubing, 4130 Steel Tubing. In the oil and gas market, 4130 tubing is made to the standard pipe schedule but uses A519 4130 as the controlling seamless specification. The steel is subsequently heat treated to L80, P110 or to the customer’s specified properties.